John Mason: Author of the best selling book "Commercial Hydroponics"
Dr Lynn Morgan PhD, renowned international hydroponic consultant and author. ACS has been teaching hydroponics since the early 1980's and provides a unique network of support services from bases in both the UK and Australia. 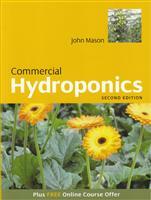 “More in - depth than Hydroponics I, Hydroponics II takes a closer look at a few plant species in particular. This course will especially suit inclusion in a 'Design your own Certificate' study option.” - Tracey Morris Dip.Hort., Cert.Hort., Cert III Organic Farming, ACS Tutor. Understanding how a plant grows in hydroponics, plant growth factors, manipulating and controlling growth, plant troubleshooting, resources, fruit set management, pollination issues, flower initiation, flower and fruit development etc. Many hydroponic growers make the basic mistake of not testing and perfecting their method for growing a crop, before they invest a lot of time and money in a full scale project. Running a samall trial may take time; but it is the best way to minimize the risk and reduce the chance of wasting a great deal of money and time. They often compare the success of growing a number of different plants, or groups of plants. A useful trial is generally designed to compare one type of factor, and in order to do this effectively, all but that one type of factor must be kept the same. For example: Four different tomato varieties are all grown in the same system, each being exposed to identical growing conditions (ie. same nutrition, same hydroponic system, same nutrition, etc). The same variety of tomato is grown in four different hydroponic systems, but using the same nutrient, pruned and trained the same way, fed the same nutrient at the same rate, etc). Growers are advised to conduct a field trial before growing any new crop or cultivar on a commercial basis. Too often growers spend a lot of money, time and effort setting up a system only to find the crop under performs or even fails. A field trial avoids many such problems by allowing the grower to assess and compare different crop treatments on a small scale before embarking on a full-scale effort. Examples of crop trials commonly used by growers include trialing different crops, evaluating new cultivars, and comparing growing media or feeding strategies. A crop trial is basically an experiment that allows the grower to make comparisons between different treatments. The treatment might be an adjustment to a nutrient solution, trialing a new cultivar, trying out a different growing medium, etc. The design and analysis of a meaningful crop trial will often require the help of a professional horticultural consultant. Before setting up the trial, the grower needs to decide on the size of the trial and the number of treatments (e.g. comparisons between new cultivars or different levels of a nutrient) to be tested. It is preferable to keep trials simple with minimal treatments to be tested. All plants in the trial are divided into ‘plots’, with each plot consisting of a group of plants in the same location receiving the same treatment. For each treatment tested, one group of plants is a control plot, which receives the grower’s usual management program. The other groups of plants also receive the identical management program, except for the actual treatment itself. The purpose of the control plot is to enable a comparison to be made with the treatment plot(s). ‘Guard plants’ are placed are used around the edge of outside of the trial area. Their purpose is to prevent edge effects that may influence growth of plots on the outside of the trial. The guard plants do not form a part of the trial – they are part of the materials used to carry out the trial. Plot positions must be done randomly to exclude experimental bias. Bias can be introduced into an experiment if the grower selects conditions for the treatment and control plots in a non-random fashion. A simple way to allocate plot positions is to number the plots, and then use a random number generator on a hand calculator to allocate plots. There are many measurements that may give valuable data, including solution analyses, foliage mineral analysis, plant height, leaf area and leaf area index (LAI), root dry weight, plant dry weight versus fresh weight, fruit quality assessment, water uptake, yields, marketable yields, taste quality assessment, shelf life and photographs. There may be a number of characteristics that the grower wishes to assess. The crop trial is evaluated by comparing the control plot against a treatment or a number of treatment plots. The assessment of the trial usually depends on statistical analysis which determines whether observed differences between control and experimental plots are likely to be due to real differences or chance occurrence. Replication of plants and plots is commonly used to improve statistical evaluation. The higher the number of replications, the lower the margin for error in the trial. In evaluating the trial, standard statistical analysis should be used to determine the true result of the trial. Simply looking at the plants and drawing a conclusion from them can be misleading. It is much more useful to quantify the trial by counting plants and carrying out a statistical analysis of the data in order to determine whether any observed effects are significant. In order to do this, the grower may need to employ the services of a statistician or horticultural consultant. Prerequisite: Hydroponics I or significant experience. What has been the most difficult plant variety you have grown in hydroponics? This should be something you have succeeded with, but have had to put extra effort into succeeding with; and perhaps success has only come after a second or third attempt. What type of system did you use to grow this in? What do you think was the most critical factor in manipulating the growth of this plant; how did you control that factor, and how did your action affect the plant’s growth? What type of commercial crops are most suited to commercial hydroponic farming in your locality, and why? Locate information on hydroponic trials that have been conducted by others. Information you find might include evaluations of particular crops or varieties, evaluations of particular technology for hydroponics, or evaluation of various systems or methods for particular crops. You should try to find information from sources such as hydroponics magazines and journals, hydroponics books, the Internet, hydroponics experts, and any other sources you can think of.